Whether it is a weekend at the races, a fishing trip with buddies, a family vacation or a week at the beach, we can help provide you will information you need to make your getaway a memorable one. Or just tell us where you want to go and we will do it for you, from mapping out your trip, to booking a campsite, to getting you all the info on "what is going on", where you will be. Blue Water Key RV Resort offers peaceful seclusion on the largest RV lots in the Florida Keys. Located near Mile Marker 14, they are just far enough from the "city" of Key West to offer you peace and tranquility amid azure waters. Yet, you will be only 10 miles from the fine dining, shopping, entertainment and historical offerings of Key West's Old Town. 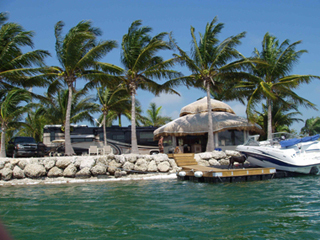 Their Key West RV lots all feature private water frontage, private tiki huts and private docks. Gated secure facility. See their site for details. April 1 - Dec. 15 In addition to 7th night free with 6 paid nights, you will receive a coupon good for one extra night free on your next visit, between April 1 & Dec. 15.